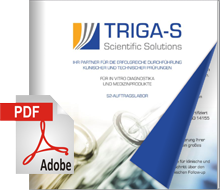 TRIGA-S is a leading contract research organisation focusing on the products of In-vitro-Diagnostics. As a specialized service provider for the requirements of the diagnostics industry, TRIGA-S offers the entire product range of clinical and technical tests. With your own laboratory for order measurements. in the field of clinical chemistry, haematology and immunology, its own sample bank, bio-statistics and an excellent network of producers, service providers and associations, TRIGA-S has made an important contribution to the development of new diagnostics for more than 20 years. As an owner-managed medium-sized company, TRIGA-S is rooted in the regional economic context and at the same time operates at the highest international level. Social commitment, responsible and sustainable action as well as the promotion of young talents are trademarks of TRIGA-S.